The unique 4TRAC four wheel drive system turns a Countax into a ‘go anywhere, mow anywhere’ utility vehicle capable of tackling slopes, mud and rough terrain. As part of the Operating Management System, Electronic Slop Alert sounds an alarm and displays a warning before an incline too great for safe mowing is reached. Dynamic Traction Control avoids scuffing on your lawn by varying the speeds of the front wheels when turning. The B Series range includes the B60-4TRAC and the B250-4TRAC tractors. Countax tractors are renowned for their cutting and collecting performance on formal lawns. Many British gardens feature slopes or areas where the terrain is uneven or prone to getting water logged. In such circumstances, the B60 4TRAC excels. Featuring 4TRAC technology, the B60 uses Dynamic Traction Control to sense where grip is required and apply the right amount of drive to the wheels. Electronic Slope Alert, part of the tractor’s OMS function will alert you with an audible and visual warning before an incline too great for safe mowing is reached. Kawasaki FS481V 603cc engine - Renowned worldwide for their reliability and performance, Kawasaki only build premium-grade engines. The FS481V is a 603cc air cooled, 4-stroke engine. 4TRAC Technology - Available on four-wheel drive models only, this revolutionary transmission design provides unbeatable heavy-duty four-wheel drive and stability with even weight distribution. Electric Slope Alert (ESA) - ESA is a unique Countax built-in safety feature that sounds an alarm and displays a warning on the dashboard when an incline is too great for safe mowing. Dynamic Traction Control - A 4TRAC feature that automatically avoids scuffing and skidding on the grass by varying the speeds of the front wheels as the tractor turns. Operating Management System (OMS) - OMS is a simple-to-use dashboard display. Everything you need to know about your tractor available in one location. 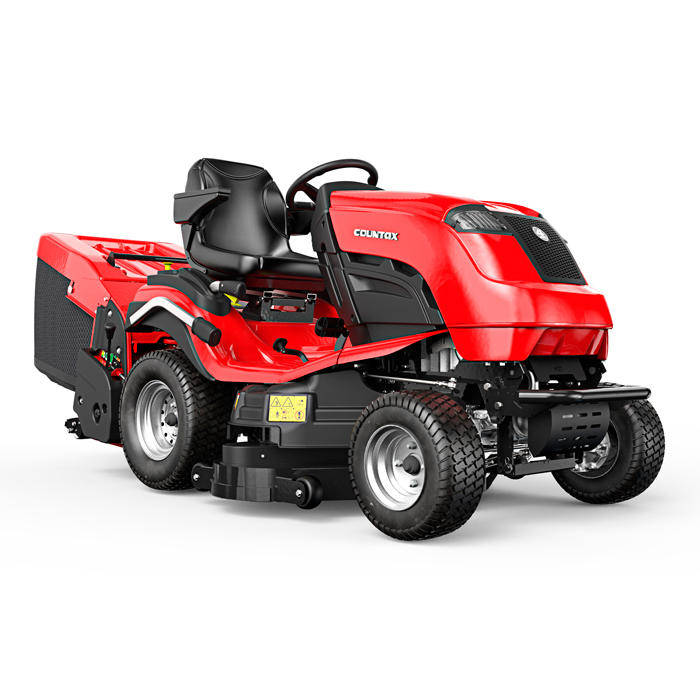 Electric power take-off - C and B Series tractors feature a push-button controlled power take-off for driving accessories. Adjustable seat - All Countax models feature an ergonomically designed, automotive style sliding seat for greater operator comfort and safety. Single pressed steel body - Found on C and B Series tractors, the single pressed steel body is a stronger and more durable alternative to a traditional fabricated unit.